Reminder: This is happening today! 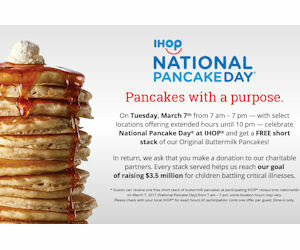 Celebrate National Pancake Day at IHOP and get a free short stack of IHOP's original buttermilk pancakes! YUM! National Pancake Day will take place today, March 7th from 7am - 7pm (select locations offering extended hours until 10pm). Check with your nearest location for more details and hours of participation.